GridBagLayout is a layout manager in AWT package. It is more complex than GridLayout. But it is more powerful or flexible than GridLayout. 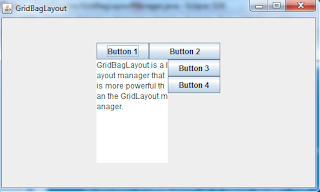 By using the GridBagLayout, you can have different components of different sizes in a single row or column. When you arrange components on a container, you do not need to specify the number of rows or columns. Instead, you will need to specify the constraints or rules by using the GridBagContraints class. These constraints help GridBagLayout to place the components in the proper places on the container. Below are common constraints used in setting up the grid. allows the components to resize automatically when the row or column expanded or thrinked. specifies the number of columns in the area to display the component. specifies the number of rows in the area to display the component. specifies the column in the grid to display the component. Its value starts from 0 (first column). specifies the row in the grid to display the component. Its value starts from 0 (first row). Example: The following code below arranges the components on the JFrame window as shown in the picture. If you have example with table, I prefer.